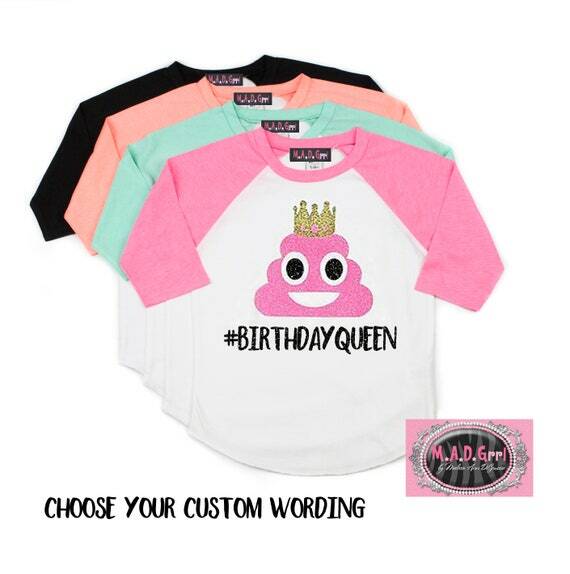 Celebrate with this princess poop emoji birthday design on a super stylish, raglan tee. All artwork and designs are copyright of M.A.D.Grrl. Choose your custom wording, custom name, or"#BIRTHDAYQUEEN", as shown. ALL ITEMS SHIP IN 7-10 BUSINESS DAYS, NOT INCLUDING WEEKENDS, HOLIDAYS AND SHIPPING TIME. Please see the estimated shipping times below. Message us if you need a RUSH order and indicate the date needed in the message to seller section at checkout. We answer customer messages within 24 hours on business days.